Since version 3.12.0 the plugin requires license registration to work; this becomes necessary because the plugin is used illegally by some customers and users. The registration requires just 30 seconds. Once you have installed the Reviewer plugin, go to Reviewer > License page. Fill the form with required information such as your Envato username and purchase code and you will able to enjoy the Reviewer plugin. You can find your purchase code on your download page at codecanyon. It could happen that the activation process fails. Here are the common errors you should get during the plugin registration. You have exceeded the maximum number of plugin copies that can be activated with one license. Otherwise, if you have just deleted your site or the plugin and you have not deactivated the Reviewer plugin license you can now manage your licenses at this link. 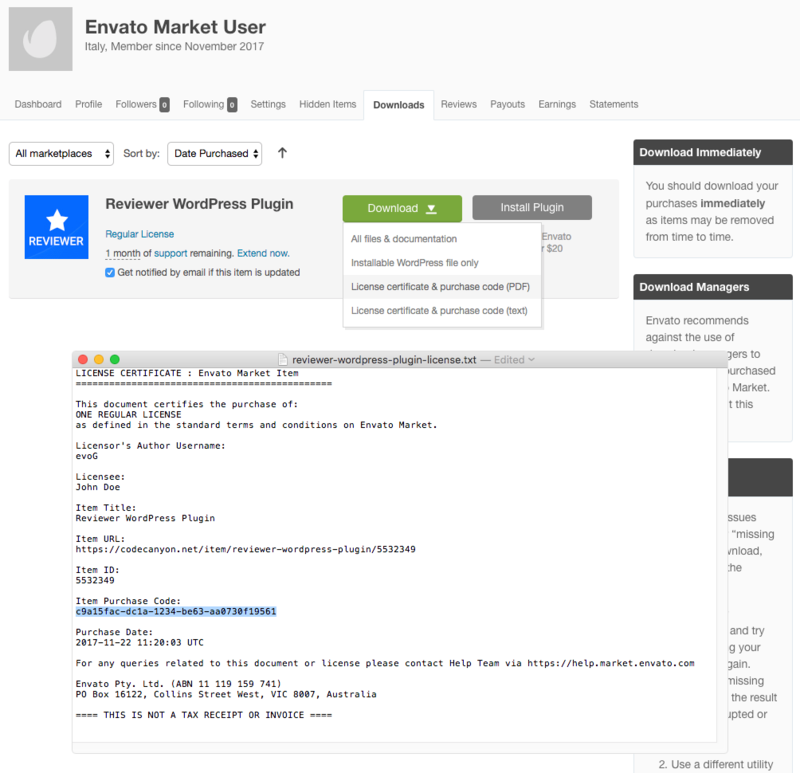 The purchase code related to the Envato username is not valid. Double-check you have entered the correct Envato username and purchase code. If you have found the Reviewer plugin in a WordPress theme, you can not insert the purchase code related to the theme purchase. So check the theme documentation, you should be able to find the correct info for activation the Reviewer plugin. Otherwise, contact the theme author for more details.